Category: Promotional Products. Sub Category: Umbrellas. 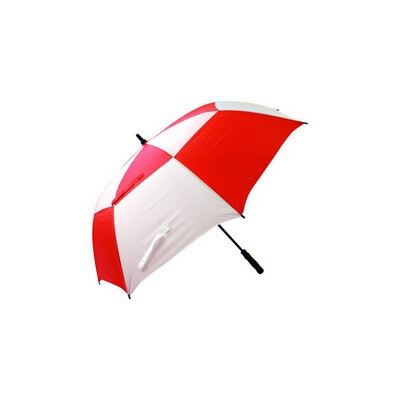 Premium quality golf umbrellas. Auto opening. Superior wind vent system. Dual velcro closure bands. Strong wind proof system. Full strong fiber glass shaft. Strong fiber glass ribs. 8 panel high quality showerproofnylon canopy. Super comfortable EVA foam handle. Item Size: 75 cm Ribs. Print Area: 20cm x 15cm. Print Method: Screen print. Decoration is based on printing same logo on multiple panels. Carton Size(CM): 107 x 21 x 15. Carton Weight(KG): 14KG. Carton Quantity: 20/CTN. Colours: Red/White.